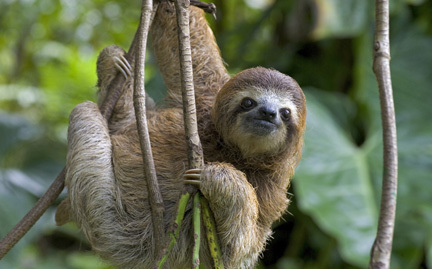 Three-toed sloths inhabit the tropical rain forests of Central America. A male sloth usually stays in the same tree for his entire life, but female sloths move after giving birth, leaving her tree to the offspring. Unlike other mammals, sloths cannot regulate their body temperatures, so they can only live in humid, warm environments. For this reason, protection of their Central American habitat is vital to this species’ continued survival.